Quality of life is our top priority for the animals and Open Door sets the standard for animal welfare. Our facility provides comfortable accommodations for 400 cats and dogs – 365 days a year! Cats lounge comfortably in Kitty City, Pampurred Place and Second Chance. Each area has multiple kitty condos and beds, window perches, toys and treats and tender loving care from plenty of volunteers who visit regularly. Our dogs spend their evenings comfortably lounging on Kuranda beds in large individual living spaces equipped with heat, air-conditioning and outdoor runs. However, during the day and weather permitting, our dogs are out doors playing or being walked by our employees and volunteers. The vision of Open Door Animal Sanctuary is to offer a loving environment and eventual home for every cat and dog in need of our help. We take in and adopt out nearly 600 dogs and 600 cats per year! Open Door Animal Sanctuary is one of the area’s largest no-kill animal shelters. Since our founding in 1975, we have provided hope, help and healing to tens of thousands of animals. We serve the community by taking in stray, homeless and otherwise unwanted cats and dogs. Each day, we provide shelter, food, medical care and most of all LOVE to 400 animals. Many of the precious angels who arrive at Open Door recognize for the first time in their lives that there can be love and trust in the world. Every animal that comes to us has a home and a second chance at life. We have a lifetime return policy which means if a family can no longer care for a cat or dog that was adopted from us, it must be returned to our sanctuary. 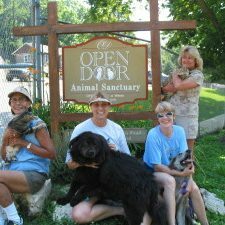 The mission of Open Door Animal Sanctuary is to provide homeless cats and dogs with the highest quality of life and a second chance to find a forever family. We are a “no kill” animal sanctuary; we do not euthanize cats and dogs for space or because they are hard to adopt. We provide dedicated love and care to over 400 homeless cats and dogs each day. We provide our residents with a largely cage-free living environment. We reduce pet over-population by offering a low-cost spay-neuter program and a humane education program to the community. We operate a pet food pantry to provide support to families in need. Joan Costello may not be a celebrity, but she has thousands of admirers. Had it not been for her compassion, vision and hard work, Open Door Animal Sanctuary would not exist today. And if not for Open Door, literally thousands of injured, abandoned and unwanted cats and dogs would have perished either in the elements or at the hands of other animal organizations. In the early 1970s, Joan Costello rented property in Chesterfield where she housed unwanted animals. Together with other concerned animal lovers, she also began a 24-hour-a-day rescue mission that covered territories other organizations could not cover. When word of her efforts became public, people brought her more animals. The operation grew very quickly. Soon Joan teamed up with Carol Perkins, wife of the late Marlin Perkins, former host of Wild Kingdom and director of the St. Louis Zoo. Together the two women built a support system for the animals including dedicated veterinarians and volunteers. They moved the operation to House Springs, and in 1975, they decided to incorporate. Open Door Animal Sanctuary was born. Joan and her comrades hired a staff and held fund raisers. People began to recognize Open Door for all its hard work. Some sent donations. Others volunteered. Open Door continued to grow. With Open Door’s increased population came financial hardship. Its continued existence weighed heavily on the generosity of supporters. With a loyal membership, however, Open Door always managed to prevail. One supporter, George Menos, went as far as to pay off Open Door’s mortgage and lease it back to the sanctuary for $1.00 a year. This continued until late 1990 when a generous donation allowed Open Door to purchase the property back from Menos. Open Door grew even stronger. Although it has experienced many changes over the years, Open Door remains true to its original principles. Every animal that enters the Open Door has a home. Every animal has its physical and emotional needs satisfied. And thanks to the efforts of Joan Costello and those who shared her dream, every animal gets another chance at life. Open Door Animal Sanctuary is a 501(c)(3) tax exempt, nonprofit organization.We do not receive any federal funding and our basic means of support comes entirely through donations. Open Door is a quality of life shelter which means animals are euthanized only if they are too sick to be treated or too aggressive to be suitable for adoption.